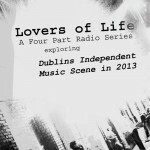 Lovers of Life is a 4 part documentary series produced by Alan Weldon for Near FM, which captures a snapshot of the Dublin Independent Music scene in 2013. At a time when the music industry worldwide is having to continuously change and evolve to keep pace with new technologies and online distribution facilities this series examines how young independent Dublin musicians are embracing this new musical landscape. This series meets the musicians, the bloggers & journalists, the gig promoters & micro-festival organisers and other people active in the industry. We also examine the support structure which is in place for independent musicians. In essence this series explores how a band, in 2013, can go from garage noise merchants to playing regular Dublin gigs and releasing their own music online to a potential global audience.